It's a bonafide Melbournism. A standing room only bar tucked away off Little Collins St where you'll find a dapper mixologist concocting delicious cocktails and serious espressos. Outside of Bar Americano we're preparing for another episode with our visiting UK friends, Mumford & Sons. These days you're more likely to find these 4 amicable lads performing at arenas and stadium venues. Although their brand of Appalachian folk is very much at home in an intimate setting. Since becoming friends with Mr Lovett through our work on episode #27 with The Staves, we invited the band to drop by a laneway when they passed through Melbourne in support of their latest album Babel. 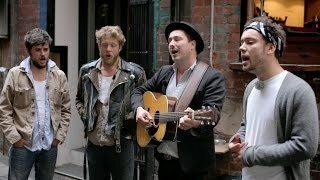 Mumford & Sons: “Timshel” Live, Sideshow Alley Gifs by downinthedungeons. Mumford & Sons "Timshel" Live - Sideshow Alley | See more about mumford, mumford sons and sideshow.